PD-L1 engagement by anti–PD-L1 mAbs is quantified at the tumor using [64Cu]WL12 in xenografts with variable PD-L1 expression. 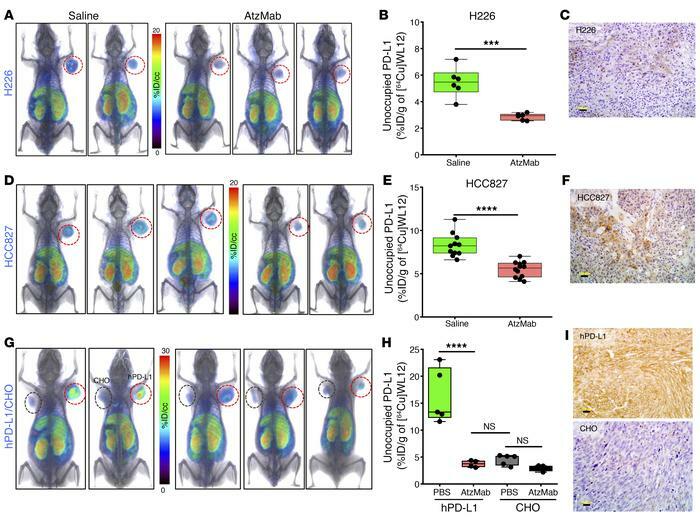 (A–H) Reduced uptake of [64Cu]WL12 in H226 (A and B), HCC827 (C and D), and contralateral hPD-L1 and PD-L1–negative CHO (hPD-L1/CHO) (G and H) xenografts in mice treated with 20 mg/kg AtzMab 24 hours prior to radiotracer injection, compared with saline-treated controls. Whole-body, volume-rendered [64Cu]WL12 PET-CT images (A, D, and G) and ex vivo biodistribution (B, E, and H) at 2 hours after [64Cu]WL12 injection (n = 8–12/group). (C, F, and I) IHC staining for PD-L1 is shown from the corresponding tumor. Scale bars: 100 μm. Box-and-whisker graphs showing minimum to maximum and all data points, with the horizontal line representing the median. ****P < 0.0001; ***P < 0.001; NS, not significant, by unpaired Student’s t test in B, E, and H.